GH Foods is recalling about 987 pounds of 365 By Whole Foods and other ready-to-eat salad with chicken products that contain corn recalled for possible Listeria monocytogenes and Salmonella contamination. They were made with corn that was recalled by the manufacturer. No illnesses have been reported to date in connection with this problem. These ready-to-eat chicken salads were made on dates ranging from October 9, 2018 through October 13, 2018. 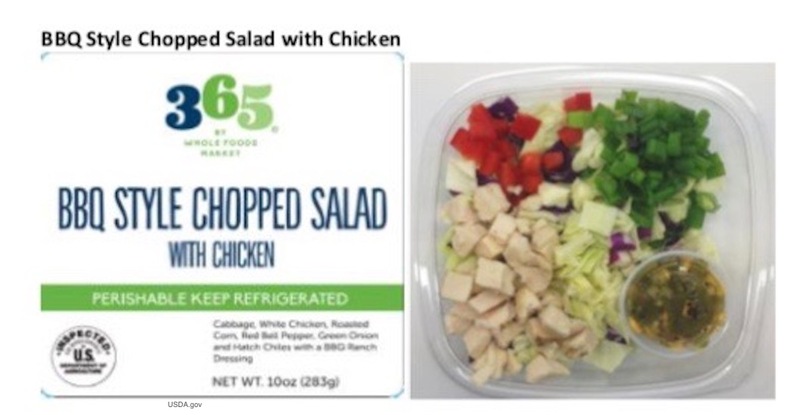 They include 9.75-ounce clear plastic clamshell packages containing “Santa Fe Style Salad with Chicken” with Best If Sold By dates from 10/17/18 to 10/18/18; 10-ounce clear plastic clamshell packages containing “365 BY WHOLE FOODS MARKET BBQ STYLE CHOPPED SALAD WITH CHICKEN” and Best If Sold By dates from 10/17/18 to 10/20/18; 6-pound bagged kit containing “BBQ Style Salad Kit with White Chicken” and Use By dates from 10/17/18 to 10/22/18; and 8-ounce clear plastic clamshell packages containing “365 BY WHOLE FOODS MARKET CHICKEN FAJITA SALAD” with Best If Sold By dates ranging from 10/17/18 to 10/20/18. These items have the establishment number “EST. P-39994” inside the USDA mark of inspection. They were shipped to retail locations in California. If you bought these salads, don’t eat them. Throw them away in a sealed container, or take them back to the store where you bought them for a refund. If you did eat them, you should monitor yourself for the symptoms of listeriosis and Salmonella food poisoning. Listeriosis symptoms include high fever, muscle aches, severe headache, stiff neck, nausea, and diarrhea. It can take up to 70 days for people to get sick because of the nature of this pathogen. Pregnant women need to be especially cautious of this infection, since it can cause miscarriage and stillbirth. 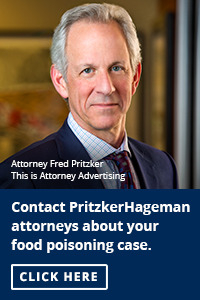 The symptoms of Salmonella food poisoning include nausea, fever, abdominal and stomach cramps and pain, and diarrhea that may be bloody or watery. Those symptoms can appear within 6 to 72 hours after exposure. If you do get sick, see your doctor and tell him you ate these recalled salads.